Bob Katter's Second Letter: How Did Australia Get into this Mess? Tired of the election debate already? Why not read things THAT WILL NEVER BE DISCUSSED IN THIS ELECTION? Whether you like Bob Katter or not, many of the issues he raises in his three “Letters to My Fellow Australians” are the things we should be discussing. Here I have reprinted – without express permission – the second of Bob Katter's “Letters to My Fellow Australians”. * The first letter outlines recent significant changes that should concern all of us. In the second letter he explains why he thinks that we have gotten into this mess. Unlike the first and third letter, this letter contains themes that those on the “left” in Australia will not agree with, particularly his comments on environmental legislation, climate change and education. However the “left” must realize there is no way Australians can break the power of the foreign corporations and their political servants in the major political parties without overcoming the way we have been divided in the LNP, Labor and Green “tribes”. We fight with each over a few crumbs in an election while foreign corporations walk away with billions of dollars each year. Meanwhile our government cuts funds for health, education, pensions and hopes to privatise everything. There are clearly major political differences separating the members of these tribes. Further we cannot ignore the aspirations of Australia's first inhabitants, not represented by any of the three political tribes. We cannot sweep these issues under the carpet, but there is also a growing awareness that many of our problems arise from the way Australia is being “managed” by our political leaders only to improve the profits of overseas investors and corporations from many different countries. I would urge you to read this looking not only for what you disagree with, but also noticing the points where you might agree. If you are against the foreign control of Australia you are not alone. It is time to reach out to everyone who can support such a struggle. So we Australians are a vanishing race only staving off bankruptcy through ‘bit by bit’ selling off the farm (our politicians call it “foreign investment”). Owner operators, farmers, tradesmen, contractors are all a slowly vanishing race and with their vanishing, vanishes the ‘land of opportunity’. As the giant corporates (increasingly foreign) slowly takeover. Why why has the Deficit on the Current Account exploded? In 1986 the Current Account Deficit was $13b. The Current Account Deficit is now running at $84b. Wool exports should now be earning Aust. $15b per yr - they’re now fairly negligible. Prawn exports should now be earning Aust. $10b per yr – they’re now fairly negligible. CSG exports should now be earning Aust. $23b per yr - they’re now fairly negligible. We send $21b a yr to the Middle East for oil. Ethanol and Biodiesel production in Australia should now be earning Aust. $21b a yr – it’s earnings are negligible. Food imports increasing nearly 10% a yr whilst food exports increase at only 3% a yr.
Mr Keating’s famous “We’ve created the freest economy on earth” no tariffs, no subsidies, no quarantine restrictions. After this decision, only two things could happen. One :- we go to Asian wage levels, around $5000 pa.
Or Two:- we close down the industries and buy everything from overseas. There may be a hundred answers to this question. I single out one – Education. Teachers from my experience are saints. The system however, is imposed upon them from above. Instead of pride we have precaution. Fifty years ago our economy was owned by people, even our big corporations were simply a cloak for an Essington Lewis (Steel-BHP), or a Les Thiess (Coal, Snowy Mountains), a Laurance Hartnett (Holden), or a Sir Hudson Fysh (Qantas), or a Peter Abeles (TNT). The Australian economy is now run, owned and controlled by Corporations, whose fund manager owners have a singular motivation – profit, and its corollary the share price. Almost all corporations of significance in Aust. are foreign owned or foreign controlled. Probably half of Aust. Biggest corporations are run by foreign CEO’s (E.G. As often as not, NAB, BHP, QANTAS, Telstra and Westpac). Clearly they owe no allegiance to the Aust. nation or the Australian people. The sheer power of these corporations awes the politicians – already practitioners of the art of ingratiation. What takes place is a sort of herding instinct. It’s safe to be with the rich and powerful. But let there be no doubt who runs Australia. It is the “LNP – ALP” corporation. You may change from one to the other, but you remain within the same corporation, with its free market beliefs running unruffled by the inconvenience of an election. The Federal secretary of the ALP Bob Hogg, on retirement stated “People must understand that most of the ALP funding comes from large corporations.” The situation is of course much worse with the LNP. 30 years ago political parties chose candidates on the basis of who can win the seat. Who had contributed to the community - on the local football committee, the local lions club, a work place union delegate, a school P&C Mum. Most of today’s politicians would have a complete blank on their CV for such activities, but they do often have charm, the ingratiatory ‘yes man’ criteria required by the party machine. Men of substance with leadership qualities cannot be counted on to toe the party line - the interests of the party machine – the corporate interest that owns the party machine. When mainstream politics go bad, people reach for extremists. The Greens Party actually have a policy to abolish the coal industry. If this was to happen, over 400,000 Australians would lose their jobs - their only source of income. So we Australians are a vanishing race only staving off bankruptcy through ‘bit by bit’ selling off the farm (our politicians call it “foreign investment”). Our politicians day by day trash the values that made us a ‘Garden Full of Promise’. Owner operators, farmers, tradesmen, contractors are all a slowly vanishing race and with their vanishing, vanishes the ‘land of opportunity’. As the giant corporates (increasingly foreign) slowly takeover. But let us give the last say to the two men who ran the Australian Economy for most of the last 40 years (1972 to 2011). Both were Prime Ministers both were Treasurers. John Howard reminded him of this 9 years later when it hit $23b saying, “that the continued worsening of the Deficit on the Current Account is the overwhelming problem above all else”. The Current Account Deficit is now running at $84b. Why why has this Deficit on the Current Account exploded? Why is your Country going broke? In 1990 wool exports at $6000 billion exceeded coal exports. Paul Keating started his “free market” solution by announcing the deregulation of the wool marketing scheme in 1990. Between 1990 and 2015 the national sheep herd dropped 64%. Wool exports are now fairly negligible. In 1989 we were on target to (over 10 years) catch up to Thailand’s annual prawn farm production. Restrictive environmental bans decimated the industry down currently to around $75m. Thailand’s prawn production now runs at around $10b per year. In the early 2000s, the Fed Govt. approved the sale of over 90% of our Coal Seam Gas (CSG) reserves to foreign corporations. CSG has negligible operating costs (wages). Price transferring means they pay negligible tax. CSG sales next year are expected to exceed $25b. • Wool exports should now be earning Aust. $15b per yr - they’re now fairly negligible. • Prawn exports should now be earning Aust. $10b per yr – they’re now fairly negligible. • CSG exports should now be earning Aust. $23b per yr - they’re now fairly negligible. Other countrys when they ran out of indigenous oil introduced or increased the levels of ethanol content (health enhancing and smog reducing) in motor vehicle fuels. should now be earning Aust. $21b a yr – it’s earnings are negligible. We won’t talk about food imports increasing nearly 10% a yr whilst food exports increase at only 3% a yr.
Or Two:- we close down the industrys and buy everything from overseas. Clothing, footwear, whitegoods, motor vehicles, petrol are now almost all imported. House building materials, cement, steel (roofing iron) will on present trends soon be 40%. Hundreds of billions of dollars going offshore each year. It is not that these considerations constitute Armageddon in themselves. But they are flashing red lights signalling that the barbarians are at the gates and not only is the cavalry not coming but ‘that there ain’t no cavalry’. How. How did we get to this? There may be a hundred answers to this question. I single out one – Education. Teachers from my experience are saints. The system however, is imposed upon them from above. “A de-intellectualised Parana Press?, programmed by a Pavlovian education system?”: - In plain English a system that inculcates conformity. Specifically the replacement of the old public examination system (objective and anonymous) by subjective continuous assessment. Thus making the name of the education game “teacher’s pet”. The sublineal message is clear “seek favour with your superiors”. The Lipinska- Fuller radical best seller “The Proactionary Imperative” avers that the ideological and political battle ground is no longer between left and right, but between “Precautionary” and “Proactionary”. The education (and media) paradigm – Precautionary - asserts that Industry causes global warming, mining pollutes, guns kill, farming destroys habitat, – ‘our cuddly Koalas will be gone’. So, as with spiritual belief, one can get to ‘the paradigm of promise’ through brain or through pain. Let us pray that it’s to be brain, not pain. So let us think – working out a pathway back to the promised land. Their sheer power awes the politicians – already practitioners of the art of ingratiation. What takes place is a sort of herding instinct. It’s safe to be with the rich and powerful. The Federal secretary of the ALP Bob Hogg, on retirement stated “People must understand that most of the ALP funding comes from large corporations.” This was indeed a dire warning – a dire warning - that went unheeded. The ALP is also financed by unions, who are dependant often for their incomes from pay deductions, ‘taken from’ the worker’s pay cheque by the corporation, not ‘given by’ the employee. This is called site coverage. This deduction arrangement means the Corporation. is paying the piper. The situation is of course much worse with the LNP. 30 years ago political parties chose candidates on the basis of who can win the seat. Who had contributed to the community - on the local football committee, the local lions club, a work place union delegate, a school P&C Mum. Charly answered me “Joe did his own fencing, drove his own dozers, he got things done on the council, he pioneered and built one of the first peanut threshing machines. Kept his earth moving gear going by lite aircraft drops. Worked like a dog for his church and the church’s schools. Went for months living at and doing development work for Hopevale, a “First Australian” community. Most of today’s politicians would have a complete blank on the Charly Aderman CV form. But they do often have charm, the ingratiatory ‘yes man’ criteria required by the party machine. ALP Premier Beattie when burying the much maligned Bejlke Petersen (who by the way died penniless) in a gracious and generous tribute said “this man created the Australian coal and Qld tourism industry”. He should have added aluminium . The Country Party govt. built at Gladstone what was then the world’s biggest power station (vast economys of scale) built with 50% idle capacity to facilitate industry it was fuelled on ‘free’ coal secured under the Country Party’s Reserve Resource Policy. As a result Qld had the world’s cheapest electricity. Aluminium is congealed electricity. Men of substance with leadership qualities cannot be counted on to toe the party line - the interests of the party machine – the corporate interest that owns the party machine. A second problem is when mainstream politics go bad, people reach for extremists. The Greens Party actually have a policy to abolish the coal industry. If this was to happen, over 400,000 Australians would lose their jobs - their only source of income. The people must seize back control of the Parliaments. Clearly, phase one of the pathway back is to stop voting for the major political parties, and not go to extremists. Tired of the Election Already? 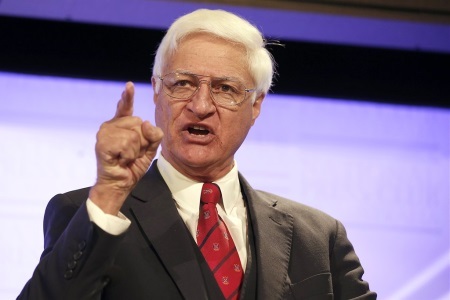 Have a Look at Bob Katter's First Bombshell!